Are you like me who loves to travel? I was deprived of traveling when I was still a student not because there wasn't ample budget, but because my parents didn't believe in the value of going out of the country. This became one of my greatest motivators to working hard, so I can save up to go abroad from time to time. I just recently came from Gold Coast and Sydney in Australia, and learned a couple of things I'd like to share with you. This is the essence of traveling for me—to learn and to share. When visiting most parts of Australia, you can save by not having to buy bottled water from the grocery or supermarket. This is because of the high standards set by the Australian Drinking Water Guidelines, which the water passes through before reaching the tap. Their drinking water is carefully selected from natural resources, then filtered and monitored 24/7 to ensure that it's safe for drinking. It's mixed with some fluoride to protect the teeth, and a bit of chlorine to make it even safer. An Australian friend actually told me that older generations in their country didn't have to visit the dentist, because of the fluoride that's in the water. Despite the fact that you can drink water from the tap, some people may still prefer to buy water bottles from the supermarket. This is just a fun-fact that I saw the cheapest 1.5L water bottle at Woolworths for AUD0.70 each. Most other stores would sell even smaller bottled water for AUD2.50 and up. 3. Start by greeting "How are you?" I find Australians really friendly! They always start by asking 'how are you?' with a smile before saying anything else. I remember a former Australian boss who would never miss asking 'how are you?' before proceeding to ask for updates or follow ups. Apparently, it's their thing. For Asians like me who's not used to this, it's a bit awkward to start with. However, by the fifth or sixth day, I was hit by this bug and also started asking the same question to others that I met along the trip. It's just a bit odd for me to transition from the 'how are you?' to what I really wanted to say. Oh, don't forget to answer their question, say 'thank you', and ask the same question back. Another thing that you'd hear a lot from Australians is them calling you their 'mate'. A friend told me that they treat everyone equally in Australia; hence, they consider everyone their mate, which means a friend or a brother. Throughout my stay though, I never heard someone calling a girl a 'mate', which appears to me that this is masculine in nature and is applicable only for men. However, I've read in some other blogs that this is also applicable to girls when 'mate' is used as a greeting. Whenever I travel to some Asian countries, I'd see fast lanes for locals and special ID cardholders. It always leaves a 'what-if' thought in my mind, hoping that I'd be able to experience those machines one day. A'las, the time has come! Sydney Immigration's innovative machine for regular tourists wowed me. You would still fill out an immigration card, but it only serves as a back-up. As you fall in line, you'd have to insert your passport to the machine, then stand straight for picture taking. Once you're all clear, you just have to drop off the manually filled out card onto the dropbox. It's fast and very efficient! It only took me less than three minutes. Riding the Gold Coast train is so much liberating and empowering! There are no gates nor barriers when riding or exiting the train. All you are asked to do is to ensure that you tap your train card in and out in the stations where you ride and alight, respectively. It's all based on the tourist's honesty. For tourists like me, I just had to purchase a Go Card for AUD10.00/day for unlimited rides to the trains and buses. If not only for my integrity, I could easily just get away with not buying a new one every day. But of course, there's always a risk of being randomly audited, so always practice honesty. When I first heard about Australian establishments' closing hours, it surprised me! I have never experienced malls and shops closing at 5PM-6PM or even 4PM sometimes. However, this is Australia's culture. They value family time very much, so not only do corporate employees get to go home early to spend time with family, but even those who are working in big establishments too. After all, I mentioned that Australia is all about equality. In most cases though, establishments close later on Thursdays. Like in our case in the Philippines, Friday evening is the start of the weekend. As such, nobody wants to be left working late. Therefore, it's been a culture in Australia to make closing hours longer on Thursdays instead. I presume this is also partly because of the higher labor costs on weekends (Friday-Sunday). Australia has quite a diverse set of cuisines almost everywhere. In fact, I couldn't pinpoint any dish that I can all truly Australian. In my 10 days of stay in both Gold Coast and Sydney, we ate a lot of Asian cuisines and some American as well. But one thing that echoes from all establishments we ate at is that food can be expensive there. The average price of each dish is about Php700 (equivalent to ~AUD17 or ~USD13). So if you're ordering more than one dish, your bill could go up higher! I remember spending AUD108.00 (~Php4,300) at Mr. Wong, a Chinese restaurant that served very good dim sum and Cantonese fare. That price is normal when dining in most hotels in the Philippines, but this is not even a hotel nor a buffet meal. For whatever it's worth, I'd like to share that Australians use the term rubbish to describe their trash, garbage, litter or junk. Some people didn't understand me, or they had to correct me, when I was asking where the trash bin is. Just another culture thing. While Gold Coast is popularly known for surfing due to big waves lying in its long coastline, it's also popular for theme parks, specifically Movie World and Dreamworld. The rides are mostly meant for adults, while character parades are for kids. I love scary rides, so I enjoyed both theme parks despite the rain. Meanwhile, if you're an avid wine drinker or just curious to learn more about wines (like me), be sure to visit Hunter Valley for a day of wine lessons and tasting. This is where I discovered that I like Moscato wines the most. For those who love nature as much as I do, don't miss visiting the Blue Mountains and be amazed at God's marvelous creations. There's a hop on, hop off bus that can take you around the entire area. Be ready to hike up and down in some areas. As an added tip, you can book all of these tours at my favorite site, Klook.com. We didn't intend to time our visit to Sydney to see the annual lights festivities called Vivid, but we're glad to have had a glimpse of it. We were told that Vivid happens every June. This is where Sydney buildings and establishments turn into wonderful pieces of art through lights and video mapping. 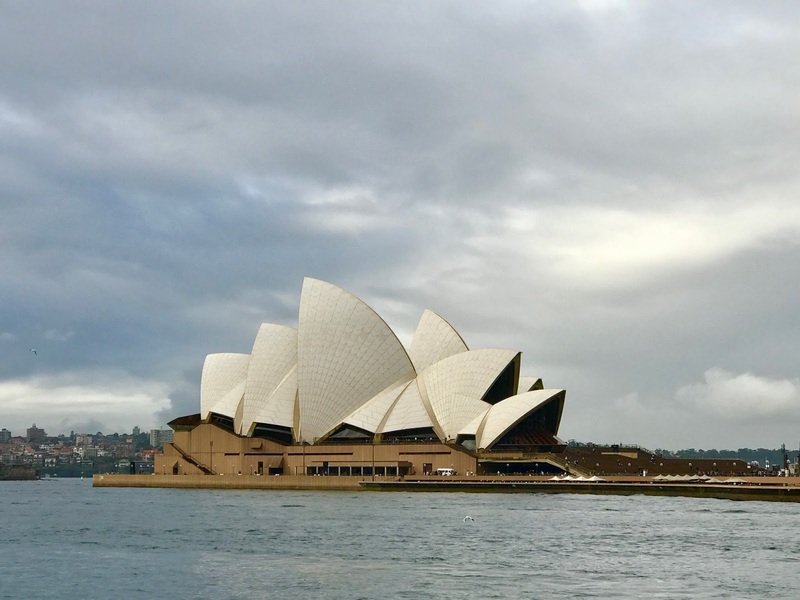 The entire festival is spread in most parts of Sydney like the Darling Harbour, Opera House, Museums, etc., and is entirely free for everyone to enjoy. Even the Sydney Harbour Bridge and train stations are outlined with colorful lights at night. 12. Skydiving in Wollongong is awesome! I realized I like thrilling activities that happen in the air rather than those in the water. As such, I like roller coasters and rides that throw me upside down up in the air. Skydiving is not any different, especially since this has been in my bucket list for so long. I finally hit that button on the Klook app and booked my skydiving adventure alone. It was one heck of an experience, and a memorable adventure for a lifetime! I did my skydiving in Wollongong, a 1.5-hour bus ride away from Sydney. Just look at how happy I am on my picture—that says it all! The Royal Thai Embassy in Canberra (shot by Glenn Ong). Not familiar to many, Sydney is actually not the capital of Australia but Canberra. According to the history, different states wanted to be called the capital, so they just crowned Canberra as one in order to prevent any further arguments. There are not much people there, and the weather is colder than in Sydney. It's interesting to note that there is an entire "village" (if I may call it that) with different nations' embassies, which are line up one beside another. Each embassy looks different from each brought by the architectural designs that show the uniqueness of each country. Pictured above is the Thai Embassy. And just as an added learning, always make sure to double check your flight details. Cebu Pacific combined two flights, so our flight was moved from Saturday to Tuesday. This is okay, since they alerted us way early. However, we forgot to check our seat assignment. Despite having several touch points with the airline, Cebu Pacific still missed informing us that our pre-paid exit row seats are gone. We were surprised that we had to endure sitting in the cramped space for 8-hours only when we got to the airplane. I couldn't believe this is the first time Cebu Pacific had an issue like this, since combining flights is normal. I'm sure Cebu Pacific could easily run away with our money had we not complain. Although they refunded our pre-paid fees, no one can ever compensate the comfort and time we spent. So there you go, fourteen (14) interesting facts I learned during my visit to Australia. I hope it becomes useful for you as you plan your visit going there. Have fun! Personally,i propose the pocket unique xiaomi bluetooth speaker flawlessly fitting cycling running climbing outdoors etc,I and my young lady companion are those music junkie who acclimated to utilizing speaker highlighting our one of a kind logo while appreciating the jazz or talk etc,i had been searching for a truly most recent compact speaker for my gf birthday a month back. Reviewsformusicians.